Getting a last-minute 10-7 victory over an FCS school that is on your schedule as a given W is not the way a team wants to begin a season. Nevertheless, that is the way the 2011 Wildcats have started off, and here’s your guide to interpret yesterday’s ridiculousness. DEFENSE: THE NEW GUYS Some exciting debuts were made by linebacker and captain Arthur Brown, who had a team-high 7 tackles (1 solo, 6 assisted); Jordan Voelker, a defensive end who moved into the starting lineup after seeing time in 5 games last season, had 5 tackles that included 2 sacks; and Meshak Williams, who transferred from Hutchinson Community College, had 3 solo tackles that included two tackles for loss of 11 yards. Both defensive ends, Voelker and Williams showed persistence in getting off blocks and causing unrest behind the line of scrimmage. Williams was not the starter heading in to the game, but he may very well be a starter heading into the next game. DEFENSE: STATISTICS While the Kansas State defense had very few pass breakups (2, to be exact), that isn’t necessarily a reason for concern. While Eastern Kentucky freshman quarterback Jared McClain threw 26 passes, only 9 were caught, and part of the reason for that was that some of the throws were so far off that they really did not necessitate a breakup by a defender. Also not as bad as it looks is that the Colonels totaled 51 tackles in the game, while the Wildcats had just 31. However, looking at other stats, that discrepancy is probably explained by the fact that Kansas State’s offense was on the field more, eating up 36:43 of the game clock with 77 plays compared to just 53 by Eastern Kentucky. OFFENSE: THE PLAYERS This probably is not how quarterback Collin Klein pictured his debut. He had a fumble (though honestly it happened because of a poor snap by new center Shaun Simon) and an interception and took two sacks. However, coming through it the clutch with a 33-yard zinger to wide receiver Chris Harper in the end zone showed some guts. It speaks to the character of the team that Klein and the other guys on offense kept working hard – and kept out of the “I can’t believe we haven’t scored on an FCS team yet” mentality – to get the job done, even if it was not in a pretty, flashy manner. 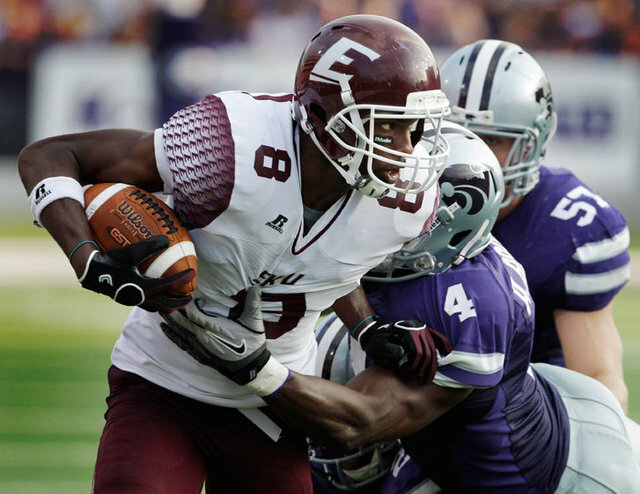 SPECIAL TEAMS: THE OVERVIEW Two fumbles in the special teams game do not a happy coach make. Snyder is all about discipline, and fumbles are an unnecessary evil. 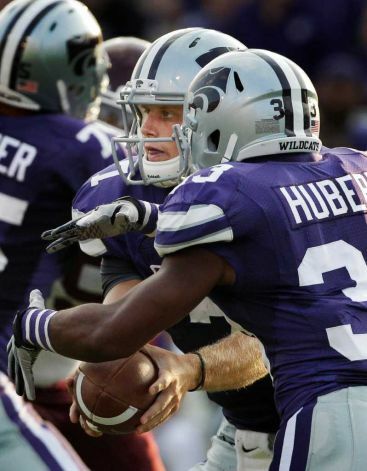 Two of Kansas State’s five fumbles (four of which the team lost) came on muffed punt returns – one by senior safety Tysyn Hartman and one by sophomore safety Ty Zimmerman. Both those guys are solid players, and perhaps their struggles can partly be attributed to the wind that was whipping around down on the field. Still, though, that can’t happen. Against a Big 12 team, that’s instantly 14 points. On the bright side, freshman wide receiver Tyler Lockett showed promise, holding onto his punt returns and even breaking off a big run that was called back by a block-in-the-back penalty. Cornerback David Garrett returned two kickoffs (one at the start of the game, and one after the Colonels’ only touchdown) for 78 yards. That is exciting. Look for him and Lockett to tear it up on returns throughout the season.